Join us as Professor Jorge Gomez from El Paso Community College presents and discusses Dr. Alfredo Quinones-Hinojosa's memoir, Becoming Dr. Q: My Journey from Migrant Farm Worker to Brain Surgeon. 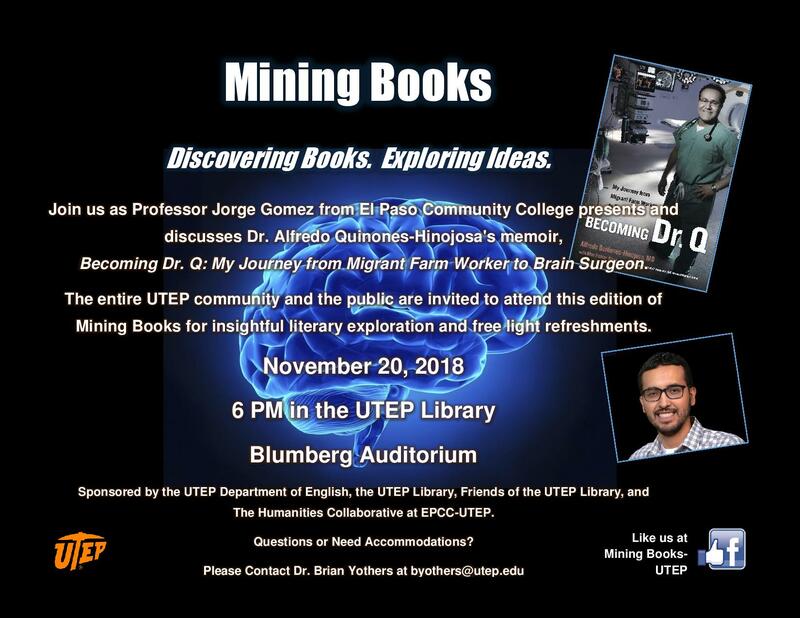 The entire UTEP community and the public are invited to attend this edition of Mining Books for insightful literary exploration and free light refreshments. Sponsored by the UTEP Department of English, the UTEP Library, Friends of the UTEP Library, and The Humanities Collaborative at EPCC-UTEP. You must LOGIN with UTEP or GUEST credentials to register for event listings. Coordinators can post events.